If you are like I am, you try your best to keep what you have in good condition. That's hard to do when you travel with kids. I know first hand as a parent and grand parent. All the accidental spills, dirty little feet, or anything else that may come into contact with the back of the seat and harm it. 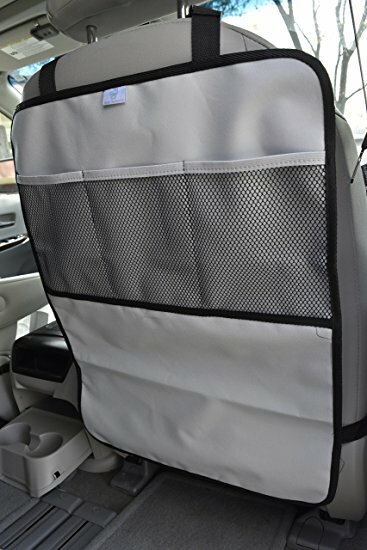 This kick mat protects the back of your seat and keeps it clean and looking newer longer. 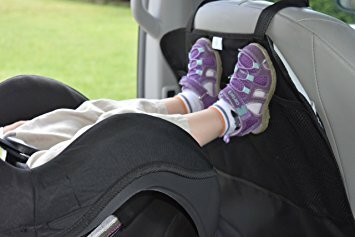 I'm excited to tell all of you about Neat Parents REVERSIBLE Kick Mat With Organizer. This is a great weapon in the war of keeping your vehicle nice and clean. It's so easy to install, just snap the straps together below the headrest, and then velcro the straps around the bottom of the seat...done! I seriously had mine installed in under 5 minutes. 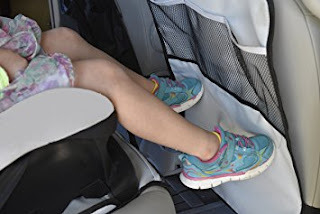 The kick at is large enough to cover the entire back of your seat, and the handy mesh pockets help keep things organized. I really like that this kick mat is reversible, light gray on one side, black on the other. Neutral enough to look good in any vehicle interior. Very nice sleek design too, now you don't have to sacrifice the looks of your car interior to protect it. It's made of durable waterproof polyester material that wipes clean with a damp cloth when it gets dirty, or it can be machine washed. It folds easily too when not in use.Keeping your interior looking nice has never been easier than this. The organizer pockets can be used to hold bottles, toys, laptop, and much more. To me this is a win / win! Keep your vehicle seats clean and your interior organized too. Now if I could figure out how to keep the little feet from kicking the back of my seat. Ha ha .